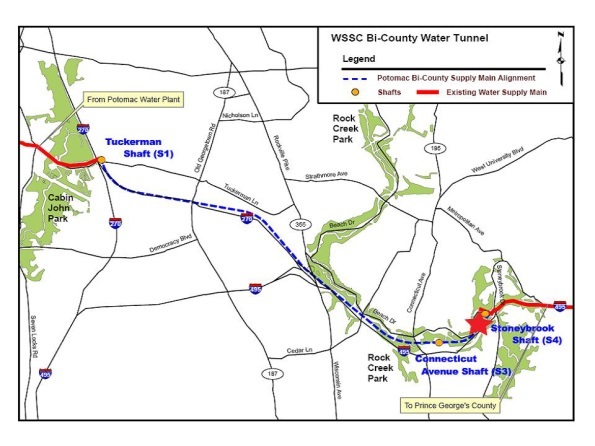 The Bi-County Water Tunnel houses a new 5.3 mile water pipeline to meet the future water requirements for both Montgomery and Prince George’s counties resulting from economic development and growth. The pipeline will connect two existing water mains: the first near I-270 and Tuckerman Lane and another in Rock Creek Park at Stoneybrook and Beach Drives. The pipeline went into service in March 2015. The project planning began in 2004 with community outreach beginning in early 2005. The capacity of the new pipeline is 100 million gallons of water a day. Initial work in 2009 and 2010 focused on building shafts to provide access for and retrieval of a Tunnel Boring Machine (TBM). The main access shaft near Connecticut Avenue was completed, then the Stoneybrook shaft. A third shaft was built at Tuckerman Lane. In 1993, the TBM was named “Miss Colleen” after the wife of the project superintendent of its first job. The Connecticut Avenue shaft is 165-feet deep and 35-feet in diameter. The Tuckerman shaft will be 138-feet deep and 25-feet in diameter. July 23, 2010: TBM began chewing through 4000 feet of rock. Nov. 23, 2010: TBM completed the first leg of the tunnel (0.8 miles). Feb. 2, 2011: TBM began the second (and final) leg of the tunnel. Feb. 28 2011: TBM was halted after sustaining damage. August 26, 2011: TBM resumed work after repair. June 2012: Installation of the 84” pipe into the East tunnel is completed. August 2012: Grouting between the 84" steel pipe and the 120" diameter rock tunnel began. Dec. 2012: The tie-in to the valve that sits between the existing 96-inch diameter pipe and the 84-inch diameter pipe of the new tunnel began at the Tuckerman site. April 26, 2013: TBM “holed through” the second leg of the tunnel. July 2013: Pipe installation began in West tunnel. Jan. 2014: Grouting inside the tunnel stopped to adjust the application process and the impact of high water inflow. April 2014: Grouting resumed between shafts S-3 and S-4. May 2014: The Bi-County Water Tunnel media event was held on May 14, to educate media, Maryland elected officials and government agency representatives about the purpose of the tunnel and its benefits to the two counties. July 2014: The grouting continued in the Western leg of the tunnel after the ground water challenges were resolved. October 2014: The annular grouting was completed for the project on October 15. November 2014: The final tunnel closure pipes were installed. December 2014: The piping in Shaft S-1 was completed and the Tunnel was filled with over 8 million gallons of water in preparation of the pressure test. Jan. 2015: The flange was re-machined in place and a successful pressure test was completed. Backfilling of the 165’ deep shaft S-3 (Connecticut Ave.) was completed and site restoration is underway. Feb. 2015: After final testing, the 72” valve is opened to put the new water main in service.